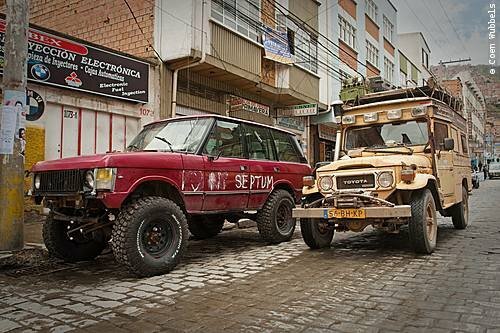 From Landcruising Adventures: Jeremy Clarkson (Top Gear) actually replaced his engine in Bolivia. Small amounts of money are starting to flow from the sporadic transporter gigs I do now and then, as well as my Indiegogo fundraiser (again, for shameless self-promotion, please consider!). 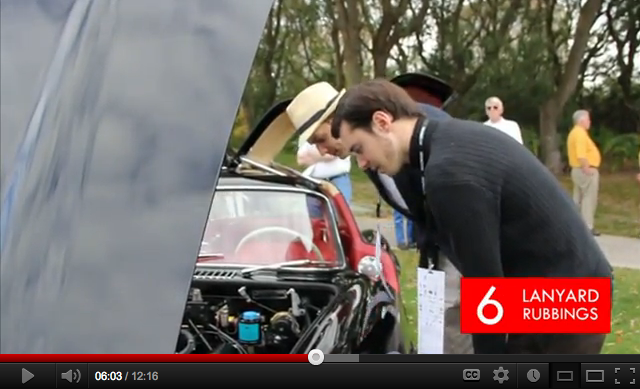 Other than that, my time has been split between the preparations, research, and, naturally, the strenuous editing process of the online series "Open Roads", hosted (and edited) by yours truly. Episode 1 is up! Ever wondered what "Lanyard Rubbings" are? Click here to find out in our glorious conclusion for episode 1! Other than this furious amount of research and desk work, nothing too significant has happened lately... until this weekend. There are not too many pictures because I am beginning to get accustomed to owning an iPhone –courtesy of Tyler. It's hard to believe that you can listen to music, take pictures and pay someone via PayPal on the same device. Jetsons technology, I tell you! TYLER: I need a transporter. It so happened that Tim, the dealer Tyler is sharing his dealership with, needed a Toyota 4Runner driven from Ohio in less than 48 hours, to be delivered to an impatient customer on Monday, Tuesday at the latest. Perfect job for a lover of the open road! The cheapest way to get to Cincinnati is to spend close to 18 hours on a Greyhound. Fortunately I could sleep most of the way and THEY HAVE WIFI. ON A BUS. The big coach arrived to the Wichita station almost an hour late, which became two by the time we arrived to Kansas City. I lost my bus connection twice, and ended up being re-routed through Louisville, Kentucky, where I was forced to cancel my hotel and stay until 5AM to catch a bus to my final destination in Ohio. Trying to find a restaurant at 1.30AM in Kentucky was not an easy task, and in the process of obtaining dinner, I was approached by an ex-convict who showed me his documents, I walked through deserted avenues and poetically moonlit theaters, bought a stranger a Miller light beer –he was very shaggy and original, very friendly, and actually he invited me to stay over his house for the night, which I politely declined-, and was rejected service at a McDonald's drive-through because I did not have a car. Sheesh. In the end, my dinner –and only meal for the day– ended up being a bag of Frito's at a gas station, as no hot meals were available for miles. Downtown Cincinnati, 8AM. Waiting in Government Square for a bus to take me North. Seems easy, right? 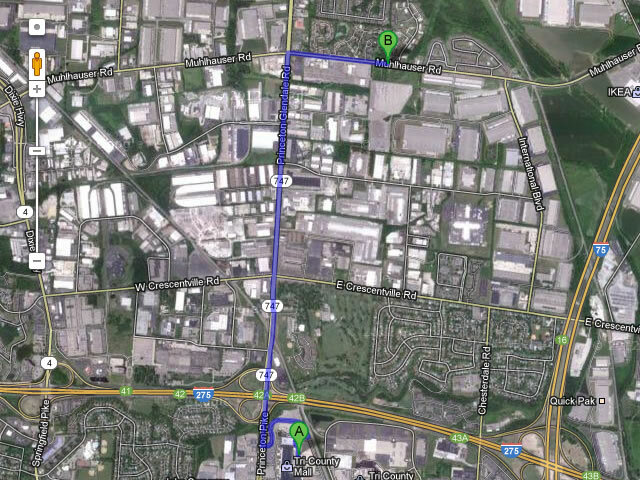 This actually took me one hour, including the many curses against the US public transportation system. ...but it was not a breeze. Not only there were no sidewalks and temperature was in the 90's; I had to run across a highway on-ramp and an off-ramp, several parking lots and TONS of private lawns. I got to the auction, inspected the car, put some gas in it, and ATE LUNCH at last. I really had to try the local Frisch's Big Boy Burger, an all-American classic! Photo Courtesy of TheKarenD. 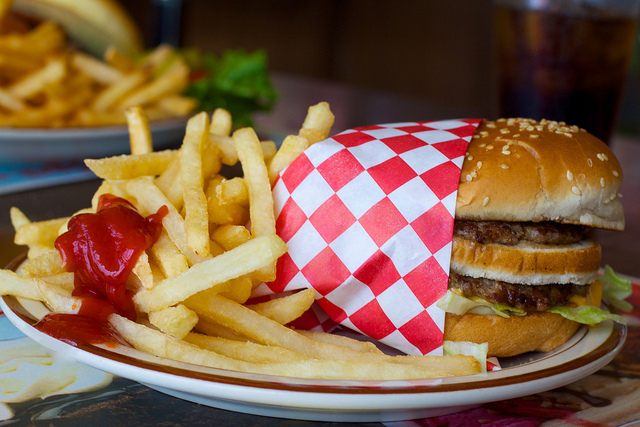 I ate at Frisch's Big Boy Burger because it is not only a reputable fast food chain, but an all-time classic of Americana. Being as hungry as I was, the burger was more than welcome, yet the food snob inside of me managed to find it... surprisingly unsurprising. 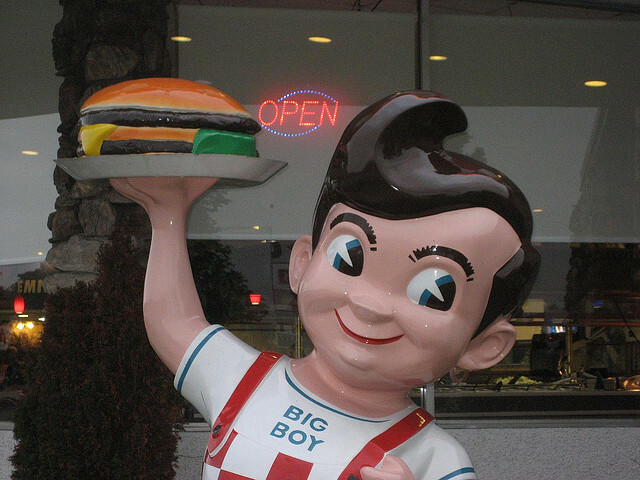 I was disappointed to see that this iconic restaurant –Big Boy was even featured in Logorama- offered burgers with the same quality, yet slightly more flavor, than Denny's. I would have expected, at least, something of the caliber of Whataburger (Texas) or In'n'Out (California). In any case, Big Boy is off my bucket list now! The burger was surprising, yet not mind-blowing. Photo courtesy of Chris Saulit. ...but my mother doesn't. She fully disapproves of the entire expedition: she considers it a waste of money made by a spoiled brat. Her definition of sanity, however, consists on a nine-to-five job that would bring one thousand euros a month ("mileuristas"); a lifestyle of uneventfulness to end in government-supported retirement, which is something that –sadly- many Spaniards aspire to. Where is the spice of life? Where is the notion of being the master of one's own destiny? "With your level of English, you could work for a hotel over here. I am not happy with this trip and it is a waste of money. You can travel later on in life, whenever you have a girlfriend". I stand firm in my decision to continue with this expedition, no matter what the obstacles may be. I have sold almost all of my possessions off on eBay, many a time at a substantial loss; and I have been working in all possible gigs that will bring money to the table. The US government does not allow me to have a part-time job, or any job outside of film, so that leaves me with having to sell most of my stuff and transport cars to save some money for the expedition. I am sincerely tired of not being able to earn any money through normal channels like everybody else does, just because, despite owning my own company, having hired Americans and being an exemplary resident, I WAS NOT BORN HERE. I am deprived of having a credit card, of switching my California driver's license to Kansas, of being qualified for scholarships and fellowships that otherwise I am a good candidate for, and even raising funds through Kickstarter. "What other right do I have in the United States other than make films and spend my money? Who engineered these laws?" TIME TO BUILD LIVINGSTONE THE 300TD!